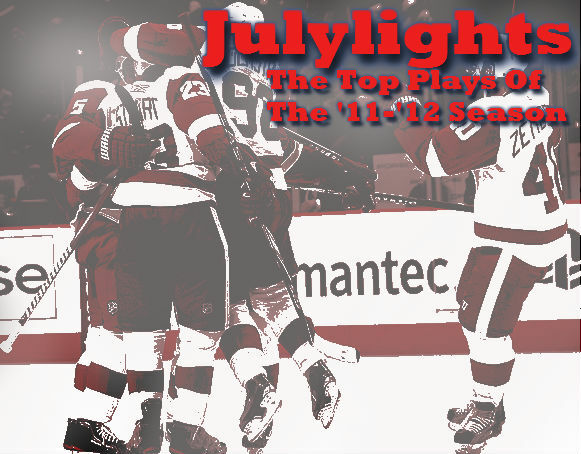 Well, all great things have to come to an end, and today we have reached the conclusion of "Julylights". We have gone through 30 of the best hits, saves and goals of the '11-'12 season and have saved the best for last. It figures that probably the best goal of the year was scored just over a month into the season. That is when Matt Duchene scored against the Pittsburgh Penguins in highlight reel fashion. Of course it was a tough decision, deciding which goal was the goal of the year, and Evgeni Malkin's Solo Act was a very close second. Let's start with the reach. Duchene has to fully extend behind him in order to control this puck, and then to chip the puck through his legs in one motion is ridiculous. To top it all off, and catch the puck on the backhand and bury it past one of the best goalies in the league it just amazing. Sure Malkin dangled four players before scoring his goal. But, there was just a different level of difficulty in this goal and that is why it got the edge. Of course, some people will not agree that this is the best goal of the year, but feel free to sound off in the comment section below. Finally, I'll see you all next year, for the top highlights of the '12-'13 season, that is if there is one.